This morning, we discovered that not only is Hugh Jackman pally with the Trumps, he also does not discuss politics with them. Issue or not? Direct from the White House, Ivanka reveals the advice she gave her dad about his trip to Europe. God help us. In this exclusive advisory for Fake News, Ivanka reveals that giving advice to her Dad has about the same effect as lying down on the tracks to prevent a train-wreck. 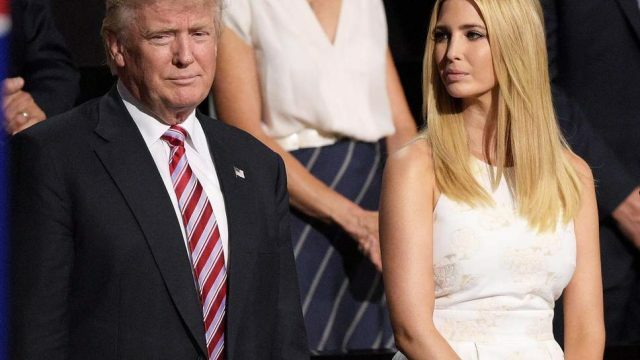 In her latest exclusive, Ivanka expresses her frustration that the only authoritative source likely to confirm her Dad’s standing as the Greatest US President Ever, is him. In another compelling communiqué from the White House, Ivanka reveals that her dad is closer to God than you might think. I hope everyone loves bacon and eggs and jackboots, because for some reason its whats on the world’s menu. Trump, Monopoly, Nazis. What a trifecta. Make it stop. In her latest exclusive communiqué from Washington, Ivanka gives an account of the debriefing she gave Reince and Kellyanne on her overseas trip with Dad.